The Department of Scandinavian Studies is thrilled to announce our 2018-19 Out of Scandinavia Artist in Residence, the Danish author Dorthe Nors. 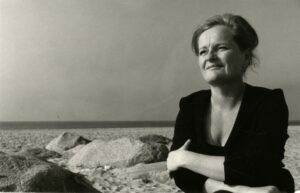 One of the most original voices in contemporary Danish literature Nors has written two celebrated short story collections, one novella, and five novels. Her short stories have appeared in countless publications, including The New Yorker. Her novel Mirror, Shoulder, Signal was a finalist for the 2017 Man Booker International Prize. As the 2018-19 Department of Scandinavian Studies Artist in Residence Nors will join us on campus from Monday, May 6 through Friday, May 10. Honoring the intention of the annual OOS Artist in Residence Program, Nors’s visit will focus on working and interacting with students in the Department of Scandinavian Studies and across campus. While here she will visit Kjerstin Moody’s SCA-224: “Scandinavian Women Writers” course and Ursula Lindqvist’s SCA-360: “Nordic Colonialisms” course. She will also be welcomed by faculty members Phillip Bryant, Matt Rasmussen, and Eric Vroomen in Gustavus’s Department of English, where she will visit courses including “Introduction to Creative Writing,” “Writing Fiction,” and “Editing and Publishing.” Nors will also engage with the Writing Tutors in Gustavus’s Writing Center and join students for a fika in the Swedish House during her stay. In addition to her class visits, Nors will give a reading and book signing at the American Swedish Institute in Minneapolis at 7:00 p.m. on Tuesday, May 7, and a public lecture, “From the Danish Outskirts, via Sweden — to the World,” on campus in the Melva Lind Interpretive Center at 7:00 p.m. on Thursday, May 9, which will be followed by a reception in Nors’s honor. Both evening events are free and open to the public. Please help us share the word about Dorthe’s upcoming visit and help us give her the warmest of Minnesota and Gustavus welcomes this May! !